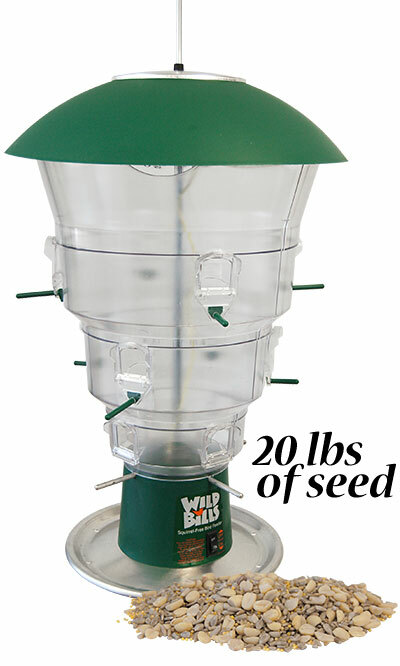 Discourage squirrels from overtaking your bird feeder with the Wild Bills Electronic Bird Feeder and Seed. The innovative, Wild Bills Electronic Squirrel Proof Bird Feeder provides birds a safe feeding haven, while preventing squirrels and raccoons from feeding. Designed using animal training techniques, this generous feeder provides squirrels and raccoons with a mild electric correction when they attempt to feed, while keeping birds completely safe from this correction. Squirrels, raccoons, or other pests large enough to touch two metal contact points, such as standing on the feeder tray and touching a port, will complete the electrical circuit and receive the mild correction, however, birds' feathers are such poor conductors that birds may feed without this concern. A convenient on/off switch at the base of the unit allows you to turn off the electronic system for cleaning or refilling. This robust feeder has a massive, 16 quart seed reservoir, easily accommodating the included, 20 pounds of Wild Bird Seed Mix, Waste Free Blend. Three separate sections in this clear plastic reservoir allow you to offer several varieties of seed, to see quite a selection of birds dining. The 12 feeding stations have individual perches designed by an ornithologist for maximum feeding comfort, and the attached, 11" diameter base tray helps any captured water drain as well as catches seed. The significant, 15" diameter top dome protects this reservoir from the elements, and lifts up the included metal hanger for cleaning and filling. Use this hook to hang this item in a tree, or add a Wild Bills Pole Adapter Kit (not included) to display the unit on a pole (not included). The plastic and metal construction is perfect for use for many seasons, and a single, 9 volt alkaline battery (not included) powers the system. Keep a wealth of food available for birds, and not squirrels, with this Wild Bills Electronic Bird Feeder and Seed. One year limited warranty.